I've been bothered lately by how messy my desk is. I know I should clean it up - whenever I do, I always discover critical papers I should have dealt with months ago except they got buried - but somehow other things always take precedence. Well, a friend sent me some photos that demonstrate that maybe my messiness isn't so bad. 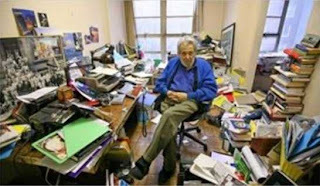 It plays on the old saying that creative minds are rarely tidy. Okay, I don't feel so bad now. Ha ha ha! 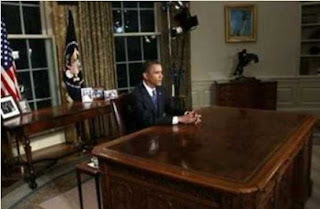 And now you've reminded me to go clean off my desk. I feel so much better now about my own messy desk!! OMGosh, I love it! I'm suddenly so proud of my piles! I think I'll leave my desk just like it is then. My first thought was..What? That is not bad. Mine keeps getting buried in junk mail. I'm pretty sure that was not what was giving those men their clutterd desk. Obama's lookin' good though. When you have about 50 people cleaning up behind you it's easy to sit there and pose with your nose in the air. now i know why my son turned out to be the way he is.....one of the desks above is not his..and it is not theclean one either. 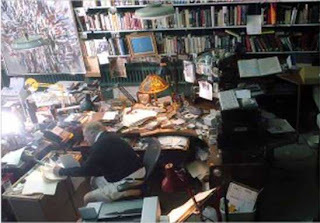 i am messy with my work area also..soi guess it is in the genes. OK, that's a definite chuckle. I used to have a sign over my work area that said, "Heh! Don't move my clutter...I have a system." My desk has these hidden elevator things, like those plate dispensers in high volume cafeterias. I put paper on a pile, and all the other papers under it just descend deeper into the magical chasm below, many never to be seen again. Others magically reappear in other piles except for when I am looking for them. I loathe my piles, and envy people who can DEAL WITH each paper they pick up. I'd rather go photograph something. It is easy to tell the desks of the four who are/were brilliant and the one who is NOT. Well, I guess I just hafta say it. A neat desk is a sign of a sick mind. I enjoy robust mental health, and am clearly in very good company here! Not surprised about Obama's desk. Tabula rasa - a clean slate. I looked at your desk, and thought, "Hmmm, not so bad." 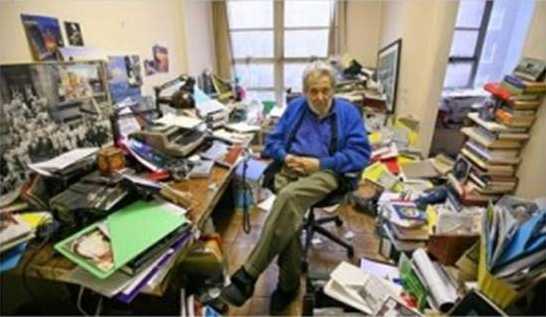 Would love to have Mr. Buckley's office...ALL THE BOOKS!!!! Don't remember. Did one of those make it to President? 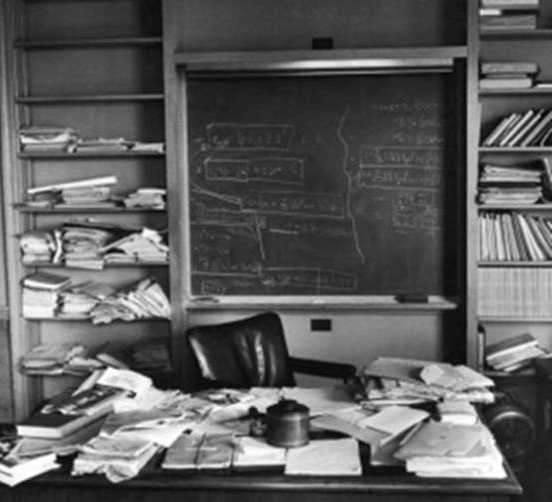 After someone saw Albert Einstein's desk they accused him with the phrase "A cluttered desk is a sign of a cluttered mind" to which he replied "then an empty desk is a sign of …?"